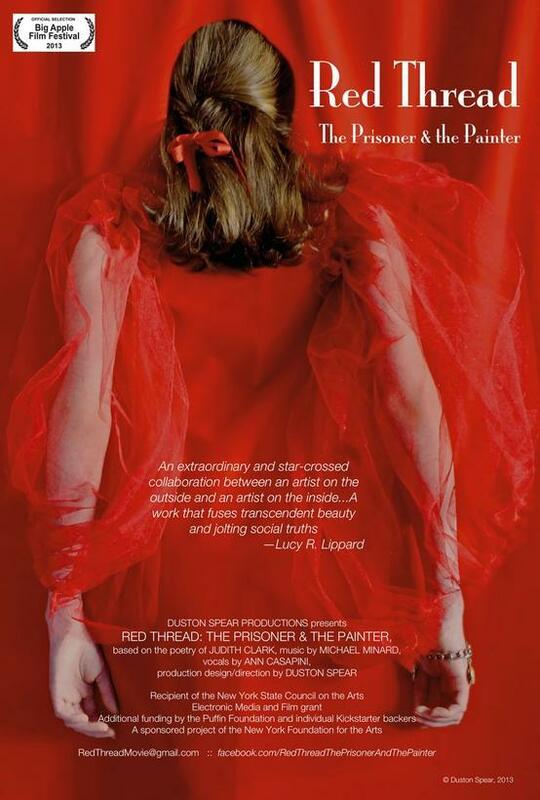 Red Thread: the Prisoner and the Painter is an operatic short film based on the poetry of Judith Clark, written during her ongoing internment at Bedford Hills Correctional Facility. The film screening will be accompanied by a workshop production that incorporates live performances from the featured vocalist, Ann Casapini and dancer Cynthia Fuller-Kling and will include a premiere of three new songs by Michael Minard, based on Ms. Clark’s poetry. Duston Spear, producer and director of Red Thread, is an artist, activist, and exhibiting painter since 1982. Red Thread is an operatic film short that incorporates live performance. Red Thread has been shown at Cage on Hester Street, Big Apple Film Festival and the Film Anthropology Archives and it is digitally distributed by IndiePix Films. In the film two women, both products of the turbulent 1960's, meet and examine the choices that put one of them behind bars. Now in their sixties they find commonality in the invisibility they share as older women on both sides of the prison wall. This is a true story, based on the poetry of radical Judith Clark, now in her 4th decade of internment. Clark, who was a political activist in the 1960s and 1970s, is serving a 75 year sentence for being a getaway driver in the 1981 Brinks Robbery. Now 66 years old, she has undergone a profound transformation, from radical to educator and caring role model. The only way she'll ever be released from prison is if Governor Cuomo grants her clemency. The 30 minute film screening will be followed by a live concert of three original songs written by Michael Minard for the operetta, performed by Ann Casapini, along with Phyllis Ross (keyboard), and Cynthia Fuller-Kling (dancer). Duston Spear (Producer/Director), has been an exhibiting painter in New York since 1982 . She has works in the collections of the Metropolitan, Brooklyn and Weatherspoon Museums. A recipient of awards from The NY State Council for the Arts, Art Matters, Creative Art Fund, Experimental Television and Creative Time, Spear’s, Past: a retelling of Unce Tom’s Cabin, is the third project that the New York Foundation for the Arts has sponsored, including the short film Red Thread: the Prisoner and the Painter, distributed by IndiePix Films (2013), 3 Women in Black, was an artist’s new works project from 1993-1998. Spear’s artists books, papers, video and the original 3 Women in Black costumes are housed in the Special Collections of the University of North Carolina. Michael Minard is a composer, writer and performer. As a composer, he has written extensively for television and film and was a staff songwriter for Sesame Street. His ballet Friendly Fire was performed by Ballet Arabesque, a state ballet company of Bulgaria. In a recent New Yorker review, Richard Brody wrote that the dance sequences that he scored for the celebrated film Losing Ground were “among the best musical numbers in the modern cinema.” Minard volunteers weekly in an arts program at Bedford Hills Correctional Facility for Women. He is currently working with Duston Spear on her film, Past. Phyllis Ross is a pianist and keyboard player, performing locally, most recently joining Michael Minard in the pit at the prison performance of Amazing Grace: An Original Musical. She is a member of the Network of the Bard Institute of Writing & Thinking, and faculty emeritus at Western Connecticut State University Department of Social Work. She teaches Writing for Re-entry at Bedford Hills Correctional Facility for Women, and offers writing workshops in the community. Ann Casapini is a singer and a certified Therapeutics Yoga instructor. She has sung in various productions in NYC, at the Orlando Opera Company and in Paris, at Le Bataclan. She has toured nationally in How Sweet It Was: A Musical Tribute to the 50’s, a bi-lingual tour of Don Quixote, and has sung leading roles in several Theatreworks, USA productions. Her voice has been recorded as the narrator for various children’s educational videos. Currently Ann enjoys singing ‘Kirtan’ with a group called Tejase. She holds a B.F.A. in Acting from Purchase College and an M.F.A. from the New School for Social Research in Media Studies. This project is supported in part with public funds from the National Endowment for the Arts, Art Works; The New York City Department of Cultural Affairs in partnership with the City Council; and The New York State Council on the Arts with the support of Governor Andrew Cuomo and The New York State Legislature. The Bronx River Art Center expresses its appreciation for the support of The City of New York, Mayor Bill de Blasio, Bronx Borough President Ruben Diaz Jr., Council Member Ritchie Torres, and members of the Council's Bronx Delegation.